I did not grow up in church. I grew up in a wonderful family, who was very close, I had parents who loved each other, and we believed in God, we just didn’t go to church. I can remember friends in elementary school asking what religion I was. I answered, “Well, I think I’m Christian.” I mean I was American after all, right?! As I got older, I can remember many people who were Christian telling me two things that were very confusing. Neither of these made sense to me. First of all a sinner? That felt a little judgmental, how could someone possibly call me a sinner? I was a good person. And Jesus died for me? What does that even mean? I didn’t even know Him and why would he die for me?? This was all so offensive to me. Really, think about it for a moment. When you call someone a sinner it means you’re telling them you’re going to hell. No one wants to hear or believe that! It wasn’t until I was 21 years old did I understand what sin and Jesus death on the Cross truly meant. I lost my father unexpectedly when I was 19 to a heart attack. Our whole world shattered and everything I thought I knew about life, and death, and time on earth flipped upside down. This led me to start asking question and truly seeking answers. I needed to know what happens after you die, who is control of your time on earth, and why people were always telling me about Jesus. My now husband patiently began to answer these questions. One evening, we sat down to watch the Passion of the Christ. I still did not truly understand sin and Jesus’ death on the Cross-, but I was seeking and my heart was warm towards God. There is a scene in the movie based on scripture in which a woman is caught in the act of adultery. In biblical times, the penalty for being caught in adultery was death. This woman committed a sin that deserved death according to the law. So the religious leaders dragged her out to be stoned to death. With their stones in hand, ready to do justice and kill this woman, Jesus walks up and enters in. He stands in front of her, as she is scared, filthy and bloody from already being dragged out to face death. You see her reaching out her shaking, filthy hand toward His feet. He kneels down and draws a line in the sand. She knew she deserved death; she was filled with shame and guilt, covered in dirt and blood and Jesus stands in front of her, as her Defender as if to say, “Her sin deserves death, but I will stand before her. My grace is sufficient and my death will satisfy.” The religious leaders drop their stones. In this moment, I realized I was that woman. While I though of myself as “not too bad, a good person, certainly not a sinner”, this visual of God’s grace made me see my sin for what it was. My sin earned me death, and Jesus by His grace, stood in the gap to defend me and rescue me. My eyes were opened, I saw my sin, and I mourned. I grieved deeply over how sinful I was. I cried. I confessed. I repented. And I thanked God for the gift of His son and His death on the Cross. 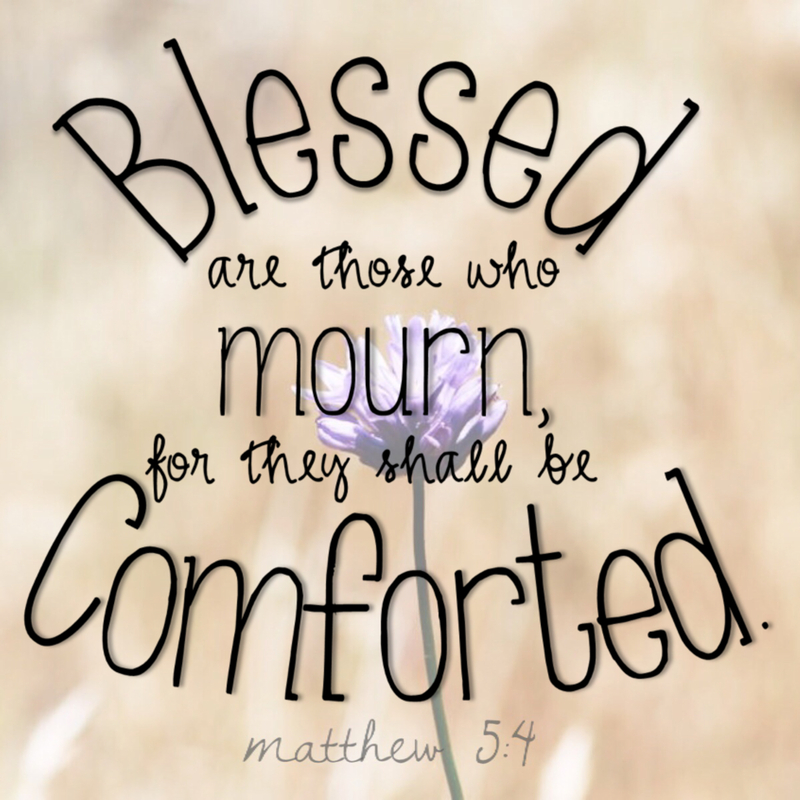 This beatitude “Blessed are those who mourn, for they shall be comforted” is not something to quote when a loved one passes. While God will comfort you in your mourning, this mourning mentioned here is referring to our sin. When we truly see our sin for what it is, when we truly understand how deeply embedded sin is in our lives, it should lead us to mourn and grieve. And, it should lead us to gratitude that Jesus would reach out His hand to defend and rescue sinners like us. 1. What does it mean to mourn? 2. How is mourning your sin different from feeling guilty over your sin? 3. Have you mourned your sin? Ask God to reveal your sin to you, to see it for what it is, and then remind you of His grace.